The Hard Disk also known as the Hard Drive is the device the computer uses to store data on. The hard disk measures about six by four by one and a half inch. The hard drive goes directly in the computer case. It has a IDE or SATA cable that attaches to the motherboard. Also, it has a power supply cable that connects to it directly from the power supply box. 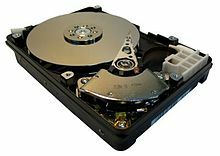 The hard disk has the following main parts: - Read Head - Write Head - Platters of Disks - Actuator Arm - Power connection - and The Spindle. The read head is a laser that reads the platters. The write head writes data on the platters via magnetizing them. The Platters is where the actual data is stored. The more platters the hard disk has, the more storage room it is; they are directly related. These disks are usually either from metal, glass, or ceramic. The Actuator arm is what controls the read/write heads putting them where the data is intended to be on the platter. The power connection is the part that internally connects the power to the spindle. The spindle rotates all the disks to help the read/write heads be in the correct place. The faster the spindle can spin the disks, the faster the hard drive can respond to commands; they are directly related. These days most computers are made with hard drives that hold at least eighty Giga-Bytes. The hard disk is protected and surrounded with a metal case to prevent all outside substances from entering the disk area. Now that you know how the Hard drive is designed, and how it has weaknesses, it is very important to know that you should periodically back up your data on your hard drive. "Backing up" your data is a term that means to create a duplicate of the data on your hard drive. This way, if your primary hard drive fails, you won't lose any of your important data, files, music, or contact information. Today, there are also many other ways of backing up data such as cloud computing where your data is stored on a server and can be accessed using the internet. Data loss is unpredictable and sometimes inevitable. Having data backed up is very helpful. It makes the recovery process a lot less painful. But sometimes you forget to back your data up, so then what? There are specialized data recovery firms like SALVAGEDATA Recovery. They take damaged drives apart in a "clean room" (like the ones where computer chips are made) and temporarily repair them so they're able to obtain the desired files. They use the acquired data to reconstruct the information on the damage hard drive. If they are unable to obtain the data they need, their engineers attempt to match the meshed data to appropriate file types to try and reconstruct the original files. This page was last edited on 8 December 2016, at 19:52.